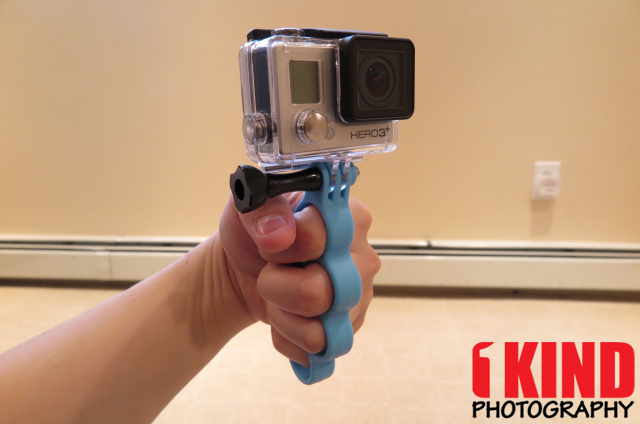 Overview : Hit the streets, surf, or snow in style with the black GoWorx GoKnuckles for GoPro HERO. 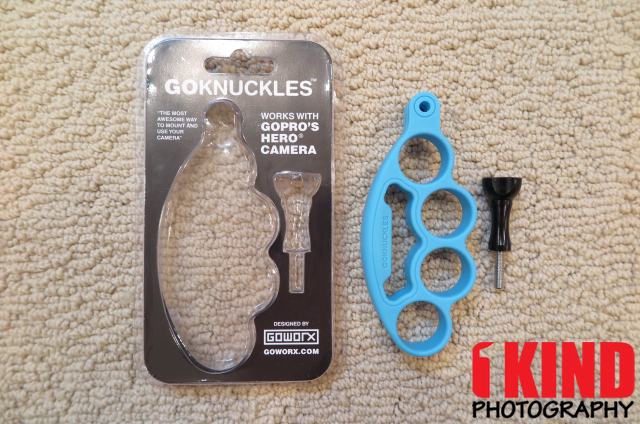 Inspired by the classic look of brass knuckles, the GoKnuckles is a functional handheld mount with an integrated three-prong GoPro mounting interface. Your HERO camera can be mounted facing towards you or away from you, letting you capture yourself and others during action sports and adventures. An anodized aluminum thumbscrew with stainless steel hardware comes included for securing your HERO housing or frame. 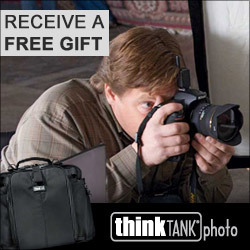 Quality/Usability : We were contacted by GoWorx to see if we were interested in reviewing their GoPro HERO accessories. 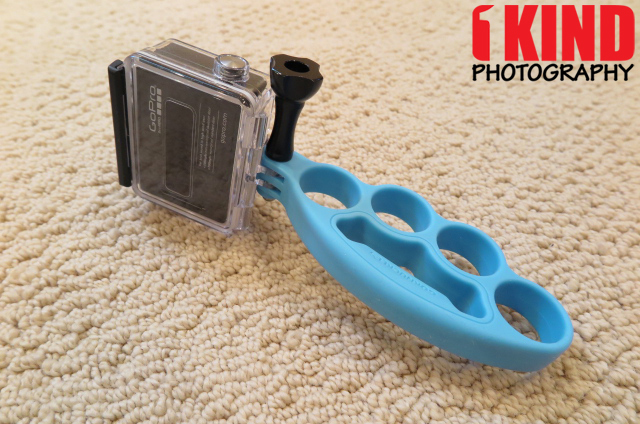 Here at 1KIND Photography, we love to review all kinds of products not only to help spread the word but to potentially help the manufacturer improve their product and to give them unbiased feedback. 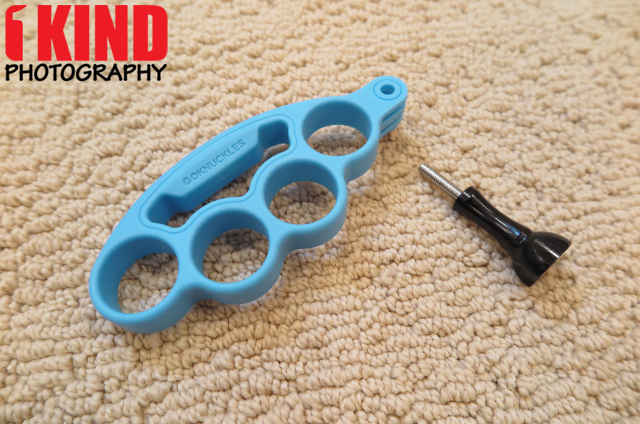 The GoWorx GoKnuckles is really simple. It comes with the knuckles and thumbscrew. It comes in multiple colors: black, orange, blue and slime green. 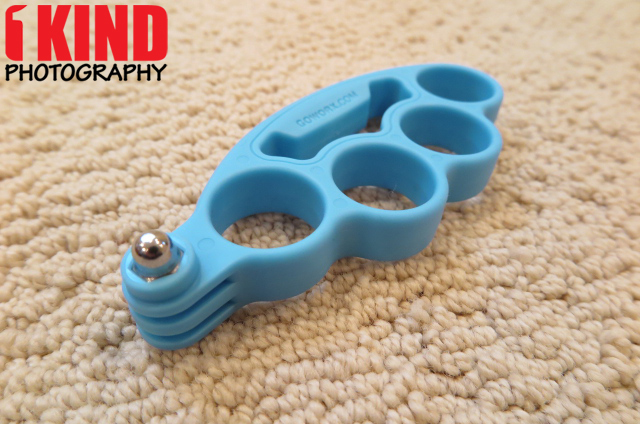 The GoKnuckles resembles brass knuckles but is made of durable lightweight plastic with a rubberized texture to it for added grip. 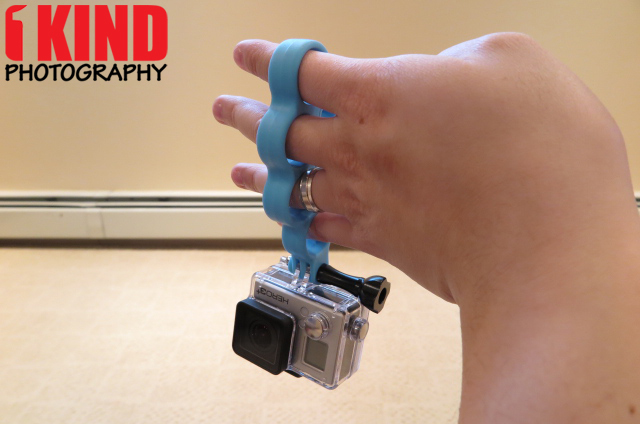 The top of the GoKnuckles is a three-prong mount that lets you attach a GoPro HERO. One thing I noticed when I opened the package was that one of the prongs was bent in. Not a big deal since I bent it back but I noticed on the inside that the edge turned white. Same as if you bend a piece of plastic, it turns white/cloudy. It would be nice if this was more reinforced and more sturdy but once the GoPro is mounted, you have nothing to worry about. 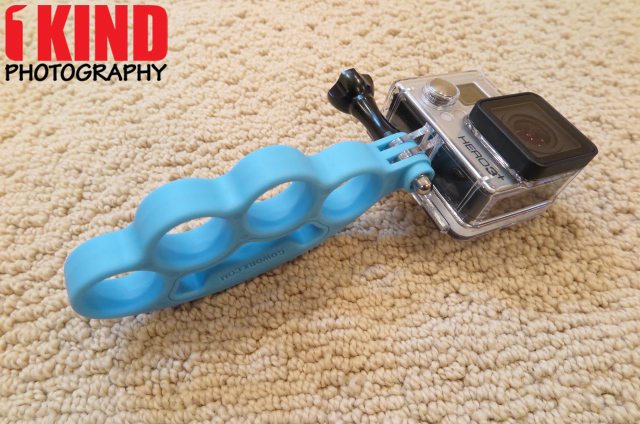 The images above show a GoPro HERO mounted onto the GoKnuckles. 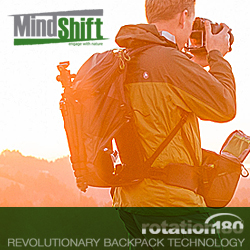 You can either have it facing forward for POV (point-of-view) or turn it around for a selfie. Holding the GoKnuckles felt comfortable. I would say my fingers are average and there was still plenty of space left for bigger fingers. I can even open my hands and the GoKnuckles still felt secure in my hands. 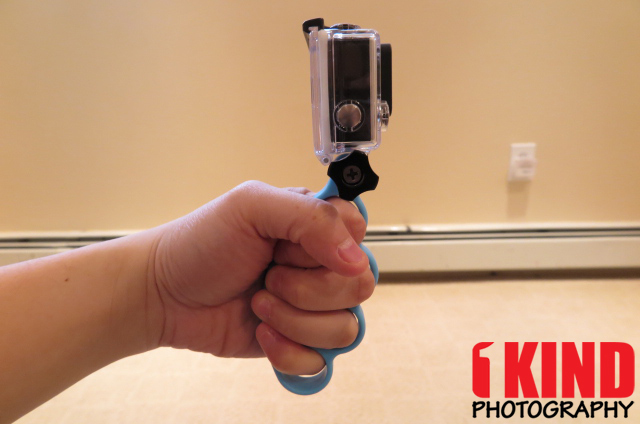 Want to get a lower shot with the GoPro HERO? You can flip the GoKnuckles upside down. 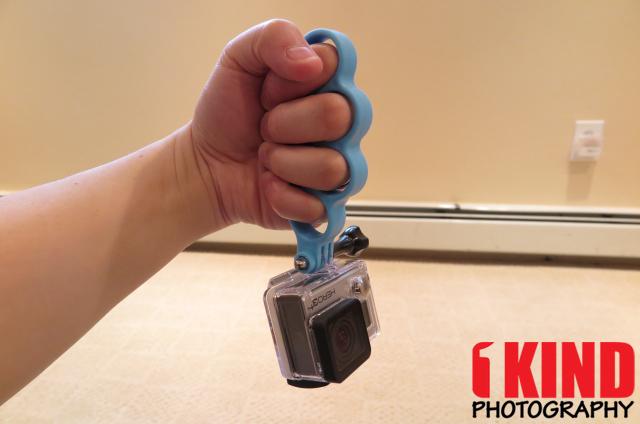 Conclusion : Overall, the GoWorx GoKnuckles for GoPro HERO is a nice product that lets you get steady shots. I would like to see the prongs a bit more sturdier and maybe a strap attachment so I can attach a wrist strap for when I'm not using the GoKnuckles.